Event photography Sydney. Lighting the Sails, Sydney Opera House, Vivid Sydney 2014. 22/5/2014. Vivid Sydney is the Southern Hemisphere’s largest festival of light, music and ideas, which for 18 days - from 23 May to 9 June 2014 - transforms the Harbour City with its colourful creative canvas. 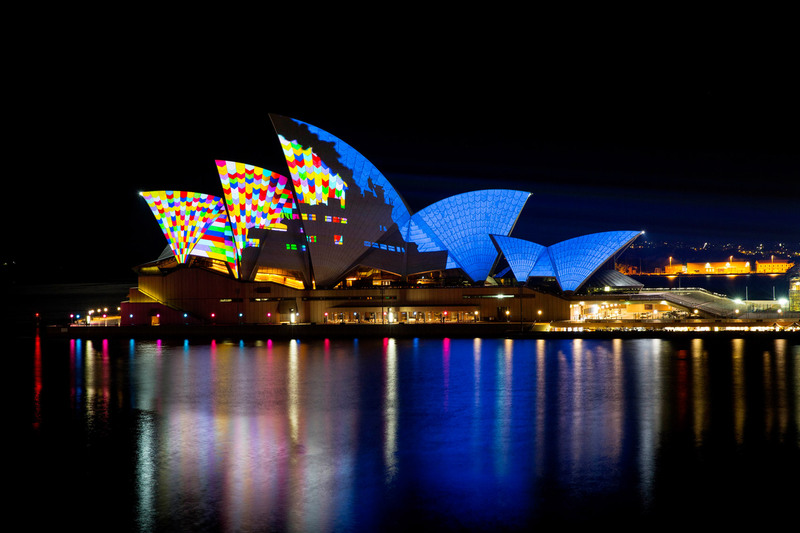 Now in its sixth year, Vivid Sydney, owned and managed by Destination NSW, features large scale light installations and projections (Vivid Light); music performances and collaborations (Vivid Music including Vivid LIVE at the Sydney Opera House); and creative ideas, discussion and debate (Vivid Ideas). For more information contact Hannah Le Coic Destination NSW Publicity Email: hannah.lecoic@dnsw.com.au Phone: 02 9931 1416, Mobile: 0419 093 882. Picture Credit - Destination NSW/ James Horan.